F.M. 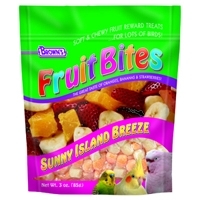 Brown's Fruit Bites Sunny Isle Breeze 3 oz. Fruit Bites are zesty, soft and chewy snack reward treats bursting with flavors your companion pets will love. Small animals will find these real fruit treats simply irresistible. 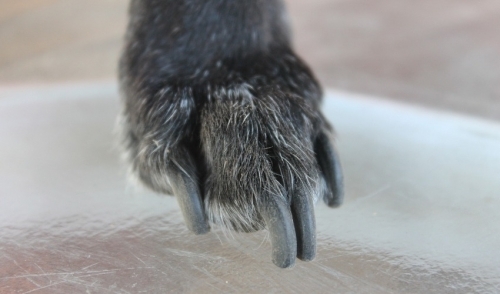 Feed them as a snack, a reward, or mix into their daily diet for a very special meal. F.M. Brown's Second Helpins with Chili Peppers Parrot 7 oz. 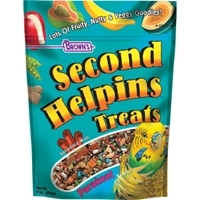 Brown's Second Helpins Hookbill Treats are so irresistibly tempting your pet bird will surely want more. That's why we named them Second Helpins. Our scrumptious, chunky, Big Bite morsels are wholesome pieces of real fruit, nuts, veggies, pasta, pretzels and berries with a splash of chili pepper seasoning in every bite. Plus, we've added our chili pepper hoops that are jam-packed with essential nutrients and beneficial bacteria to aid in digestion and the overall well-being of your pet. F.M. 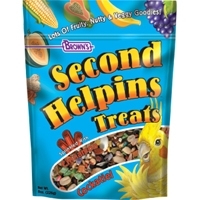 Brown's Second Helpins with Cinnamon Coakatiel 8 oz. 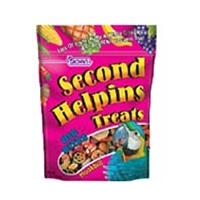 Second Helpins Treats are so irresistibly tempting, your companion pet will surely want more ....thats why we named them Second Helpins! Theyre jam-packed with wholesome pieces of real fruits, nuts, veggies, seeds and grains. F.M. Brown's Second Helpins with Cinnamon for Parakeet 9 oz. 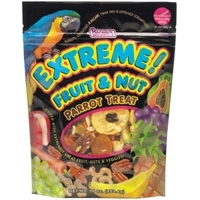 Extreme Fruit & Nut Treats are exceptional for Extraordinary birds! These Treats are loaded with extremely great stuff. It's jam-packed with a balanced blend of natural, wholesome fruit, nuts, seeds and veggies that your bird will find enticing and nutritious. What a great way to reward your pet during training or just because you love it! F.M. Brown's Extreme Fruit & Nut Big Bites 24 oz. 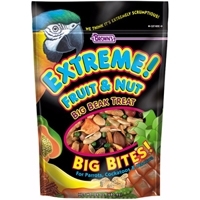 Extreme fruit & Nut Big Bites Treats are exceptional for extraordinary birds! These treats are loaded with a balanced blend of natural, wholesome fruit, nuts, seeds and veggies that your bird will find enticing and nutritious. F.M. Brown's Golden California Millet Spray 25 lb. Brown's Golden Millet Spray is field fresh and American grown. 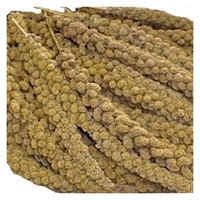 Golden Millet Spray is a natural and delicious treat. Our sun-cured, plump millet sprays are relished by all types of pet and wild birds. F.M. 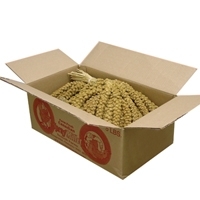 Brown's Golden California Millet Spray 5 lb. F.M. 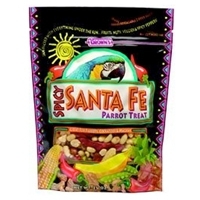 Brown's Spicy Santa Fe Parrot Treat 20 oz. This blend of fruits, nuts and veggies offers a tasty treat for your parrot or other hookbill bird. Spicy red peppers provide extra zest for a flavor your pet will adore.